Ajumma fans at the concert, so what? Fandom culture is very strong in Korea as well as other countries. A variety types of fan clubs are formed and those fans do many activities for their ‘stars’. Like other communities, fan clubs are considered as one of communities with people who got the similar interests each other. In this case, similar interest should be a ‘star’. A star could be sportswoman/man, actors, artists, singers, models, writers, filmmakers, politicians (maybe? ), or even characters of animation or comic books whom are living in the imaginary space. Among these examples of fan club, I would like to talk about a case of one of band’s fan club in Korea. Twitter is a sort of an intersection for people to share common or uncommon ideas and thoughts. I didn’t use tweeter for last few years but now I’m one of active users of tweeter. There are many reasons why I use twitter but one reason could be that it is useful to share information from other fans about my favourite singer. At the same time, we could share the concert review with each other after every concert. Actually I’m not a very active fan like other fans, but I could be an active fan through interactive communication with other fans on twitter whom I followed. Even though we never tweetup before but we meet almost everyday on twitter. It is so glad to know someone who have same interests with me and share our thoughts about the same thing together. However, it happened few days ago. There is another online community website for this singer and a sort of a quarrel between fans was occurred. These fans argue about something related to the singer on the BBS. I have no interest in this online community website at all, so I didn’t know about this website that much. But one thing I knew about this website is that most of them who take very active roles are quite younger than other old fans of the singer. Anyway, there’s a quarrel between fans and one of fans wrote her or his thought on the BBS. I was outraged at the way she/he had written. Here is a sentence that makes me uncomfortable. Well, it was interesting to me to know what younger people consider old woman (they think over 30s is ‘old’, she/he wrote). And it’s not shocking the way this kind of people think about ajummas or old woman because I’m a researcher or a sort of expert of ajumma research, so I know. But I was angry to read that sentence because of their old-fashioned mind or thinking about women, especially old women (over 30s is OLD? of course it is not young age but not too old yet?). What’s wrong with old women? (over 30s?) Is there any law and regulations that old women (over 30s) are prohibited to come to the concert? And what’s wrong with ajummas? Okay, if they’re official ajummas, SO WHAT? You know what? The singers you like are over 30s too. Then, why do you think only female fans who are over 30s should be treated as annoying ajummas? As I mentioned in previous post, I think they have a sort of misogynistic perspective towards women, especially non-younger women. According to them, I’m an ajumma because I’m over 30. But I will keep going and enjoying their concert as much as I can. 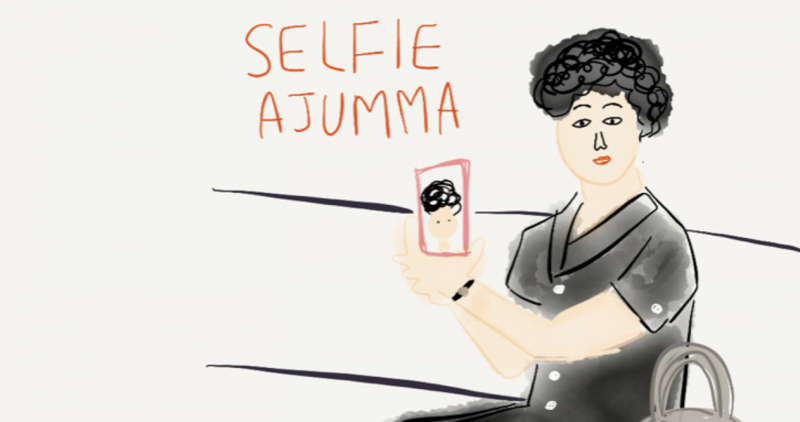 I don’t care what others think about ajummas (women who are over 30s, they said). But one thing that I feel disappointed is their prejudiced and outdated view of ajummas. Oh, don’t forget! You’ll be an ajumma very soon, too.